What happens in a college course on video production? Watch this video to find out! 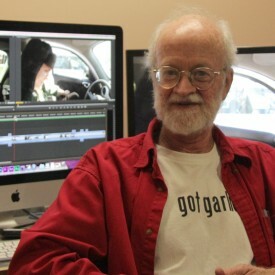 Bob Gershon began his media career editing for a news service in New York. He worked as an advertising writer and producer on local, regional and occasional national accounts in upstate New York before getting his Ph.D. and beginning to teach. His documentaries and other work have been broadcast on Vermont and New York public television stations and the Discovery Channel. Working on them has taken him from the back roads and woods of Vermont to the Buddhist monasteries of Nepal. An early adopter of telecommunication technologies, he has worked on a number of statewide task forces on telecommunication development and deployment. He and his wife have two daughters who live in New England. They now live with their cat. He enjoys being outdoors whenever possible, even if it just means stacking wood. Produced award-winning documentary and similar productions. Wrote articles and panel presentations on video, documentary production and streaming media for academic and industry journals and conferences. Participated in several statewide organizations and initiatives that have improved access to and use of Internet technologies for education, business and general use. Awarded federal and state grants for telecommunications development and use and for documentary production.